Swindon-based Castles Residential Sales and Lettings’ managing director Mark Noble has become the new chapter president of Read BNI, part of the world's largest referral organisation. The Read Chapter has referred £791,853 worth of business in the past 12 months to its 31 members. During this period, Mark, pictured, held the important position of chapter membership co-ordinator. As president, he aims to help Read BNI surpass the £1m mark in referred business. Mark was elected to his new role in February after being nominated by many of his fellow members, and officially took up the post this month. BNI has more than 185,000 members in 60-plus countries worldwide. On average, members increase their business by 20% in their first year. Other members of the new leadership team at Read BNI are Jeremy Morcumb of Mortgage Advice Bureau, who becomes vice president, and Sam Binstead of Chilvester Financial Planners, who is the new secretary/treasurer. 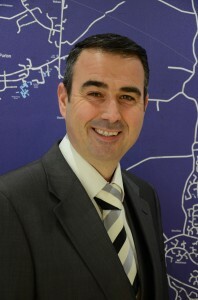 Mark launched Castles Residential Sales & Lettings in 2002. It continues to grow strongly and is now one of the area’s most successful estate agents. Read BNI meetings take place every Wednesday morning at Hotel Campanile on Swindon’s Delta Business Park.